All in one week - how did I fit it all in? My Gambian Experience of sunshine, beautiful beaches, the biggest party ever, African dancing, Kunte Kinte, schools - a life-changing experience! Well, I still can't believe it, but I got the chance in November 2008, as Chris invited me and many of her family and friends to go to Gambia with her to celebrate her birthday. I remember when Chris first told me about The Oasis Project, I was very interested. She had such a clear vision. Chris was very conscious of wanting to help the community in a way that would improve people's lives and change things for the future. This wasn't just a charity shop - The Oasis Project is about empowerment. It was Chris Hayter's dream, but last November her vision became a reality after months of hard work. Chris and I had many conversations about her visits to Gambia. She ships unwanted, good quality items donated by family, friends and companies to the project shop in Gambia. The items are sold at a small fee, which goes straight back into the community in Bakau, to build a better future for those less fortunate than ourselves! Something I found truly amazing was the way everyone welcomed us with such warmth and generosity in Gambia. Everyone was so friendly. Everyone on the compound was so kind. Such generosity from desperately poor people was very humbling. I learnt a lot from this attitude. Whilst we were there, Chris' friends on the compound threw a party in her honour. It was to celebrate her birthday, to thank her for what she has done for them and their community and to welcome her family and friends to Gambia. I have never experienced such hospitality and generosity. None of us, including Chris were expecting such a party. They had organised people to come to our hotel and play drums for us all the way to the compound. They had invited people from the nearby compounds to join us too. When we arrived at the compound it was wonderful. We were greeted with a huge welcome, music, singing, dancing and so much food that they had prepared for us. People were prepared to go without to feed us! It was so overwhelming and again, extremely humbling. We were all shocked and quite emotional. Chris was so shocked. She just kept saying "…I really was not expecting this!" This party was in her honour and it emphasised the impact that Chris and The Oasis Project has had on everyone in the community and how much she means to them. It was their way of saying thank you to her for everything she has done and giving something back. When I first saw the shop, before completion, I was amazed at the interest shown. It was great meeting everyone and being a part of something so significant. It made it all worthwhile. It was wonderful watching the transformation of the shop on my trip. Chris recently told me how well the shop was doing and that the money has gone straight back into the community. Now that's what it's all about! Truly inspirational! We also visited some schools and donated pencils, books and small gifts for the children. Their gratitude was again extremely humbling. There is such a stark contrast with what our children have in England compared to Gambian children. It struck me how focused every child was in the classroom. They all wanted to learn. Education means so much to them - it is everything. For many it's all they have! Whilst in Gambia I built a lifetime of memories, forged many new friendships and had countless humbling experiences. I have seen first hand the impact of The Oasis Project and am continuing my support in any way I can. If any of you or your companies would like to offer donations or assistance with shipping costs or in any way you feel you can help, please get in touch. If you have read this personal account of my trip to Gambia and are interested in offering assistance in any way please contact Chris Hayter on 07710 625202 or email chris@theoasisproject.org. I have stepped in an out of strange worlds before, especially during the five years I spent as a flight attendant, but my week long trip to Gambia last November added a personal dimension to the experience of leaving the urbane society of London for a rustic culture in Gambia to help with an anti-poverty charity. As the travel guides will tell you, it's easy to miss The Gambia on the map as it is Africa's smallest country only 500 km long and 50 km wide; an odd-shaped sliver of land largely encircled by Senegal. I went to visit this beautiful country not to see its sights but to help a friend, Chris Hayter, a Milton Keynes business woman, and a few of her friends with her project, empowering impoverished people in an underprivileged area of The Gambia. 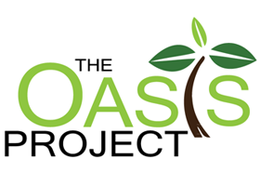 The Oasis Project, has a locally run charity shop, which is a not for profit organisation. All proceeds will go directly into helping the locals of the small community in which the shop is based. Over several weeks late last year, Chris collected items such as clothes, shoes, household implements and books; items all generously donated by friends and family. These items were shipped to the Gambia to be sold in the Oasis Project shop. 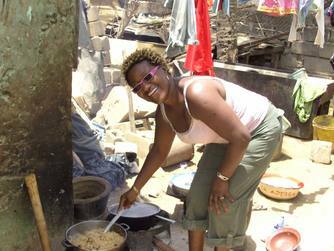 Whilst on holiday in The Gambia in early 2006, Chris was introduced to young chef called Jobis and his family. However, after several trips that year, in November 2006, Chris was led by her faith to start researching the possibility of setting up a charity shop and other ways of assisting the community, in the area of Bakau where Jobis lives. In May 2008 Chris began taking over items to be sold in the shop. Whilst Chris appreciates the good large charity organisations do in the poverty-stricken countries of Africa, her approach was to try and provide assistance on a more personal and long-term level. Since she started this project, Chris has seen how empowered the two young locals, Baba and Hela, who are running the shop, have become. The project is teaching them basic skills such as money handling, book-keeping and stocktaking. She has seen how they have grown in self-worth and confidence and she is pleased with how well they have handled this additional responsibility. The shop is based in a residential area called a compound. The compound is little more than dwellings lining dust filled streets in a rural district called Bakau. There is little in the way of greenery and scarce shelter from the intense heat; and whilst there is a nod towards 21st century technology in the form of internet cafes, on closer inspection we could see that most of these shops were closed, boarded up or laying bare. However they are not totally without modern technology as they do have mobile phones and satellite TV. There are several compounds dotted around the residential areas and this particular one is home to roughly 20 people. 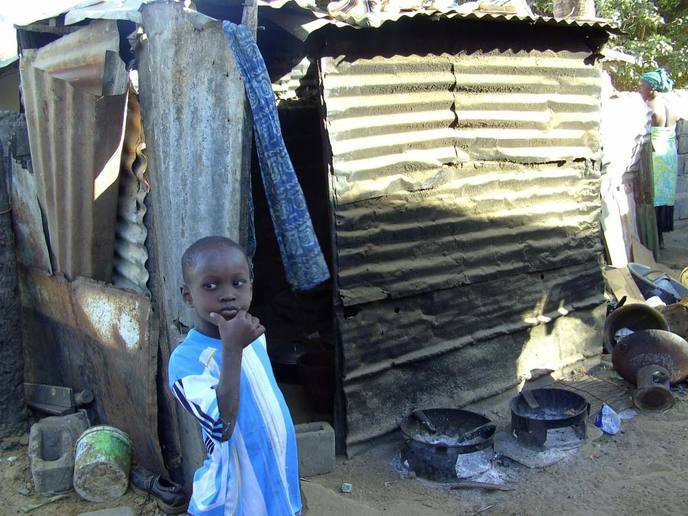 The compound consists of single room dwellings which are usually occupied by whole families. The room I saw was fairly large, however in this one room the inhabitants would cook, eat, sleep and entertain. There is only one toilet, which is shared by both sexes, and which is essentially a hole in the ground, and running water in the form of one tap. This public convenience is a new addition, and only came into existence within the last 18 months. The shop itself is small, but what was once a neglected space has been transformed by the hard work of the locals who came out in force to clean and paint. Although there is electricity, there are no street lights and the electricity regularly goes off during the evening. Therefore those residents lucky enough to have them, use torches. Nevertheless, this lack of resource, which we in the western world take for granted, does little to diminish their community spirit. 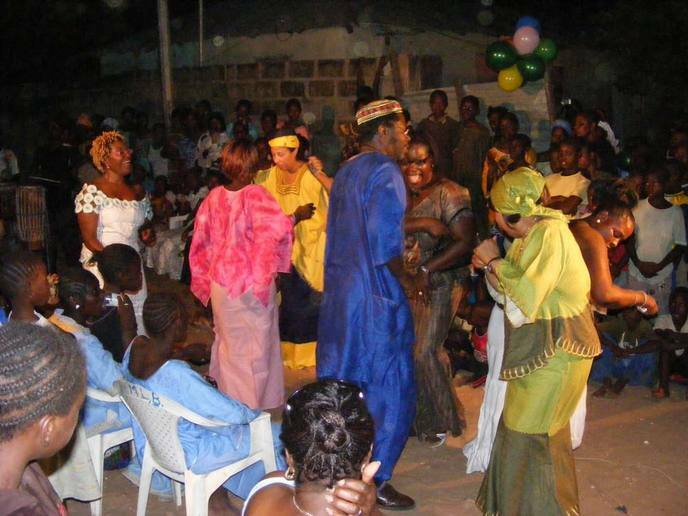 The inhabitants of the compound regularly come together to celebrate a birth, wedding, or another momentous occasion. These celebrations usually take the form of street parties, in which the inhabitants display the dancing and music they are famous for. Whilst there, we were the guest of honour at one of their parties, and so could personally experience the warm and welcoming nature which so characterises the Gambians. Not only are they generous with their time, but also with their food, and we were treated to some traditional Gambian cuisine. Within easy walking distance of the compound is one of the most luxurious hotels in the Gambia. As is the case in many third world countries where tourism is a major source of income, the divide between the rich and poor is striking. In this particular complex you are surrounded by rich greenery and facilities which the nearby compound sorely lacks. During our stay we also took the opportunity to deliver pens, notepads, and books to schools in rural areas. The government does little to support the education system in the form of resources and the most basic of items are in short supply. In one particular school, whose students ranged in age from primary to seniors, there was a lack of furniture such as tables and chairs. As informed by one of the head teachers, his school like most of the state run schools relies heavily on donations from passing tourists. It was through the kind donations that, over a period of time, his school was able to build some much needed classrooms. A typical school might consist of 2 or 3 classrooms which look out onto barren and dusty land. It is common practice for the teaching day to be split into two shifts; students would arrive for lessons in the morning and then make way for new students who attend the afternoon lessons. Although you could see and understand the teachers' frustrations at the lack of resources, you couldn't fail to admire their determination in providing the best education for the children within the limited facilities available to them. It is a sad reality that most Gambians will live and die within the economic conditions in which they are born. As Bana, Jobis' 18 year old sister explained, the only way she could fulfill her dream to become a journalist is if a Western sponsor funded her education in a western university. A very remote possibility. Chris has a strong spiritual belief, and she herself cannot explain what drove her to pursue this project, or indeed what led her back to the Gambia time and time again. Suffice to say she listened to her 'inner voice.' She readily admits to being surprised at how quickly things have developed; a venture some believe couldn't be achieved within several years, has managed to become a reality within 18 months. Her goal for the future is, as she says, 'vision and literacy.' Chris recognises the freedom good eyesight can bring, and in a country with an adult literacy rate of less than 30%, Chris understands the need of vision to forward literacy. Yet for now, this fledgling organisation is banking what money it makes, and Chris is researching how to provide eye care to people whose day to day battle is just being able to survive. Chris fully understands the struggle she faces to break down the stigma surrounding the wearing of glasses, which most Gambians see as a weakness. She is looking at the possibility of having a mobile optician visit the compound for eye tests, and is also researching the Regional Eye Care Centre, a centre which was opened in Gambia with the purpose of looking at and treating eye diseases. Although she is starting with this small compound, Chris' long-term ambition is to try and help as many Gambians her resources will allow. It is easy for me to see why Chris has such an affinity for the Gambia and its people. Although life for many is harsh, there is a surprising lack of bitterness and a warm and giving nature. There is a saying in the Gambia which goes 'you will never walk alone' as so often is sung when Liverpool football club play. Within minutes of leaving the hotel complex you can expect to be approached by locals selling their wares or willing to become an unofficial guide. It is not uncommon to find yourself accompanied by a Gambian who will educate you on the country's history or someone just willing to while away some time with you. It has a low crime rate and locals feel safe walking around at night. As one young girl said, she has never had any trouble walking home alone from a street party, which could finish as late as 4am. Although it is the smallest country in Africa it has a rich and diverse culture and a variety of ethnic groups live together with minimum friction. At Banjul airport I reflected on the 7 days I had spent meeting the locals and learning a little on how they live. I have seen many different cultures and walks of life, from the slums of India to the glitz and glamour of Hollywood, yet my experience in the Gambia is the one that I will remember.